Austin SEO Geeks is the leading company in Austin with years of experience in the SEO industry. We are only successful because our clients are successful. Now it’s your turn. Call us and see what we can do for you. Up-to-date industry posts to educate and inform you about how to increase traffic using social media. We also focus on how to gain credibility by improving your online reputation. Our copywriters will create a news worthy press release, and we will publish this in over 60 venues. Which will increase web traffic and increase conversation in the industry? We can achieve your objective and business goals with unique and creative content. We have highly qualified copyeditors that can strategically place and word content to keep the viewer engage increase sales. Promoting your business or you by flooding search engines in a positive light. Letting the negative review sink to the bottom and letting you not only shine but be better than your competitors. We know how to get you sourcing on the top of all the search engines. Time and time again we can prove this. 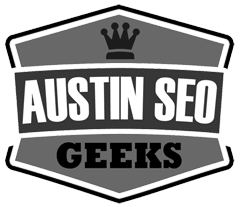 With Austin SEO Geeks we are the experts in SEO and Web Development that are up to date on today’s latest trends and regulations – we know how it’s done. We just make it look easy. We also keep up good communication with our clients at the time of providing our service and we also keep their additional demand so that we can make them 100% satisfied as we always try our best to ensure maximum quality services compared to others providers. Overall, we are highly determined to make our customers 100% satisfied. The goal of Austin SEO Experts is to provide high quality SEO service in less cost. We also update our services each and every time so that the customers can take a verity of seo services. Our services cover initial setup to training, advanced tracking solutions and custom features. Austin SEO Geeks helps you soar to the top on any Search Engine. Our SEO strategies can grant you with better placement in search results and more sales.